Velvet turbans are the in thing as they just add class and glam to any outfit like literally, any outfit. I’m sure you have seen these turbans everywhere. I did notice though that after celebrities like Toke makinwa rocked the turban the prices went gone up.Its easy to blame this on recession but really its only ‘cos celebrities are rocking it. Personally I think a major problem of this country is its people which I am part of. Certain things/items can still pass off for the prices they were being sold for , people are just taking advantage of the situation at hand . I didn’t buy this turban, all I did was tear up my younger sister’s velvet wrapper. Ok, its not as bad as you think, let me explain. Remember when velvet wrapper was a thing and people tied it in double knots, well my younger sister went over board with the trend. For some reason I am not a trends person so I didn’t get the velvet wrapper and as for the knotted wrapper in front, I didn’t rock that either. I probably did it once but I just felt like it wasn’t for me. Moving on, velvet turban were priced at #500 naira, before they became popular but now they range from #800-#1500. So as a lady on a budget, I just thought thought to myself , any velvet fabric will do this and now we have a video. 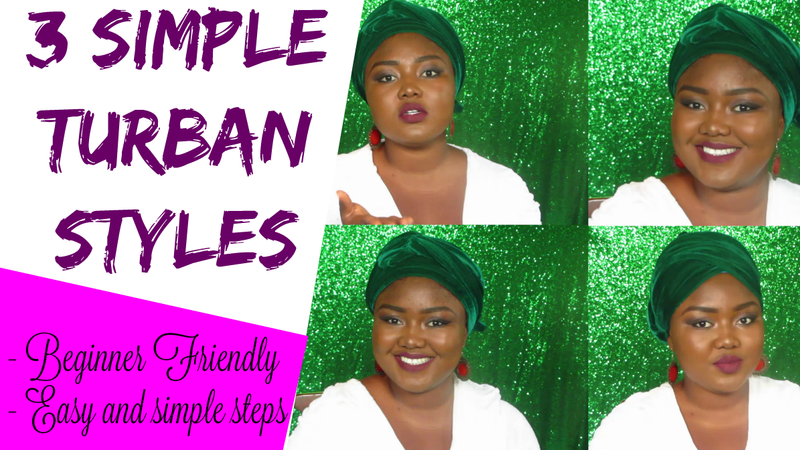 Have you seen my video on how to tie ankara scraf and how to tie gele ? you can check it out on my channel and feel free to subscribe and share with friends.